Hey, y’all! Welcome to The Flutterbies July news… It’s a HUGE month for us! First, the single “Hummingbird Heart” from our debut EP The Flutterbies featuring Maureen Davis will be playing in-auditorium before screenings at the Laemmle and Angelika theatre chains! We can be reaching 52,000 film patrons in Southern CA, NYC, Dallas, Houston, Sacramento, and more. And in Los Angeles, visit any Laemmle theatre and get a groovy coupon for Amoeba Records! Many thanks to Mike Gormley and Jolene Pellant @ Yes Dear Entertainment. Also, The Flutterbies are nominated for this year’s Independent Music Awards! We’re thrilled and honored. The IMA’s will be judged by The Black Keys, Aimee Mann, and other notables. See our recent IMA spotlight here. The Flutterbies are finalists in MySpace’s ROCK THE SPACE contest! We could win a record deal with MySpace Records, and an endorsement from Toyota (I love my Scion XA… sigh). MySpace has provided finalists a promotional widget, and whoever gets the most fans to post it at their websites, MySpace pages, Facebook profiles, etc. wins! Please click here to grab the widget! Come on… all the coooool kids are doin’ it… and thanks for the support! 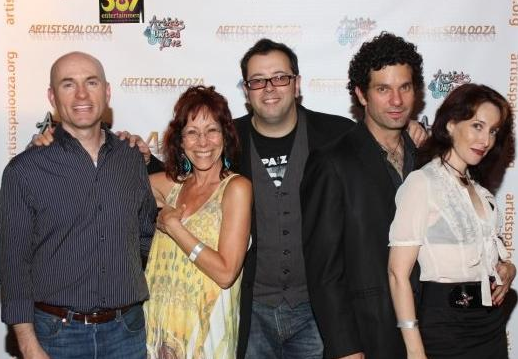 The Flutterbies with our buddy Mindy Sterling, from the Austin Powers movies! Pic taken at the Artist’s United benefit for the Living Free Animal Sanctuary, at King King in Hollywood. Later that evening, our guitarist Bart Ryan (second from right) was electrocuted on-stage by an ungrounded microphone. Proceeds from the concert saved pets from euthanasia, and bought Bart several bourbons after his ordeal. Also, click here to visit our friend Mark’s YouTube channel. He filmed a recent gig and posted some cool clips… Check out live versions of favorites from our EP, a new as-yet-untitled song, and Maureen & Adam Daniel’s infamous cover of Motorhead’s “Ace of Spades”. And give a listen to Montreal station CKUT in August/September when they add us to “The Rock & Roll Report”. Thank you to all radio programmers, and listeners! The Flutterbies’ recession special: a month of FREE gigs! 9pm to 1am: Unplugged jam! This is where we blow off steam and play some crazy covers of classics with Simon Petty. Always a truly fun night. *LIVE WEBCAST! Click here to stream the show. The Flutterbies are Maureen Davis on lead vocals, Bart Ryan on guitar/lap steel/vocals, Adam Daniel on guitar/vocals, Christopher Allis on drums, Steve Whalen on bass, and Marc Nilan on keys. Full gig info is always posted and current at the Shows page. …Davis with her Alt Country band brings 6 great songs that makes one look forward to a bigger release… What is clear when listening to Texan-tainted “How I Get Over You”, country waltz “Faith In Rain” and the subdued “Hummingbird Heart” is that Davis is a master of all styles and allows her voice to drag like only the greatest vocalists can. The Flutterbies Need You, Again! Our debut EP The Flutterbies featuring Maureen Davis is for sale at iTunes, CD Baby, Amazon, Rhapsody, etc. Buy us, baby, buy us! Photographer extraordinaire Mathew Caine took this newsletter’s amazing header pic. Thanks, Mathew!